Last weekend, I was immersed in flowers. Not literally. It’s not that time of year. Nor did I walk through a botanical garden. 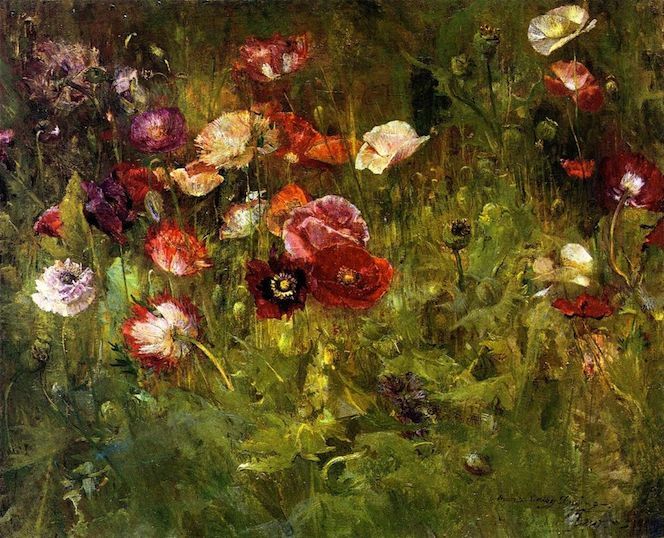 The flowers showed up in other ways: Flower Power, an exhibit at the Asian Art Museum, and The Artist’s Garden: American Impressionism and the Garden Movement, 1887-1920, a film by arts documentary maker Phil Grabsky of Exhibition on Screen. Depending on the culture and the period, flowers have their own language. If you know the idiom, the plum blossom, the cherry blossom, the chrysanthemum, the lotus, the rose, and the tulip all tell a story. Antiwar demonstrators tried flower power on MPs blocking the Pentagon Building in Arlington, VA, on October 26, 1967. Photo by Bernie Boston/The Washington Post via Getty Images. Asian Art Museum, San Francisco. Museums in San Francisco have been celebrating the anniversary of “The Summer of Love,” when some 100,000 persons converged on the Haight-Ashbury neighborhood in the summer of 1967. As one of the commemorations, Flower Power includes a variety of flower displays. For example, inspired by the ‘60s counterculture movement, Megan Wilson “interrupted” the cold concrete of Civic Center by painting Pop-ish blooms directly on sidewalks as well as on walls and floors inside the Asian Art Museum located on the plaza. In keeping with her Buddhist practice, “Flower Interruption” represents a conscious choice to create a temporary installation because, like everything else, flowers are ephemeral. In fact, much of her work no longer exists because it was never meant to be permanent. "Flower Interruption: San Francisco Summer of Love 2017," by Megan Wilson. Asian Art Museum, San Francisco. For the installation "Yedoensis" fourth-generation printmaker Ayomi Yoshida focused her interest on the Yoshino cherry tree (Prunus x yedoensis). It has a long history connected to the Japanese tradition of viewing cherry blossoms in the spring. However, Yoshida has noticed that as the earth's temperature increases, the trees are flowering in March instead of April. She says, "I once believed that the coming of spring and the cherry blossoms would always happen, but lately I am less certain. Will there come a time when the trees fail to bloom?" "Yedoensis" (1917), by Ayomi Yoshida. Asian Art Museum, San Francisco. Yoshida worked with a team of volunteers and museum visitors for several weeks to affix thousands of woodblock-printed cherry blossoms on two-dimensional images of tree branches. In comparison, trees make an even greater effort to produce millions of blossoms each year, only to drop them all in a matter of days. Another instance of transience. Detail of "Yedoensis" (1917), by Ayomi Yoshida. Asian Art Museum, San Francisco. "Summer Lotus" (1688), painting on silk by Yun Shouping. Asian Art Museum, San Francisco. Detail of "Summer Lotus" (1688), by Yun Shouping. Asian Art Museum, San Francisco. Long-sleeved kimono (furisode) with auspicious motifs (approx. 1912-1935), Japan. Silk, paste-resist dyed, embroidery. Asian Art Museum, San Francisco. Detail of furisode. Asian Art Museum, San Francisco. Vase (meiping) with design of scrolling peonies. China, Northern Song Dynasty (960-1126). Asian Art Museum, San Francisco. "Woman carrying a tray" (approx. 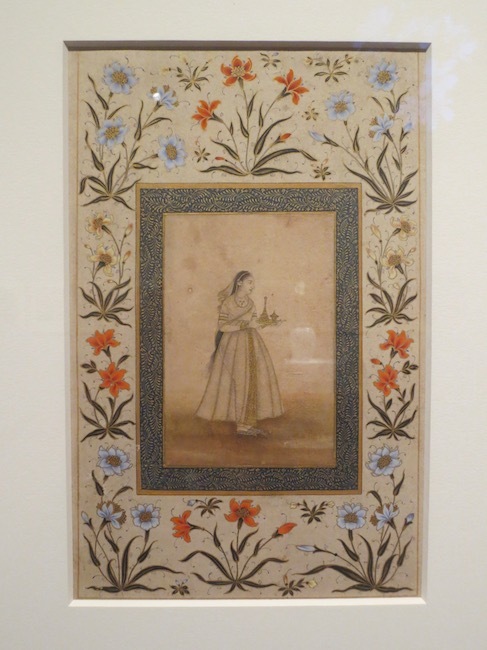 1600-1650), India or Pakistan. Watercolors and gold on paper. Asian Art Museum, San Francisco. Dish with tulip and other floral motifs (approx. 1575-1800), Turkey. The tulip became a symbol of wealth, power, and sophistication during the Ottoman Empire (1281-1924). Asian Art Museum, San Francisco. Robe (kosode) with landscape and literary designs (goshodoki), approx. 1800-1850. Japan. Silk crepe (chirimen) with embroidery. Asian Art Museum, San Francisco. Detail of kosode. Asian Art Museum, San Francisco. Dish with plum blossom and moon motif (1800-1900), Korea. Lacquer on paper with inlaid mother-of-pearl. Asian Art Museum, San Francisco. Vase and pair of bowls with "one hundred flowers" motif. Porcelain with overglaze enamels. China, Jingdezhen, Jiangxi province, Qing dynasty (1736-1820). Asian Art Museum, San Francisco. Detail of vase with "one hundred flowers" motif. Asian Art Museum, San Francisco. "The Moving Garden" (2009), by Lee Mingwei. Stainless steel, granite, water, fresh flowers. Asian Art Museum, San Francisco. Integral to the "The Moving Garden" is the artist's invitation to museum visitors to pick up a stem holder, approach the sculpture, pick one of the fresh flowers, insert it into the stem holder, then exit the museum. Once outside, find a stranger and offer that person a gift of this flower. Taiwanese artist Lee Mingwei was inspired by Lewis Hyde's book, The Gift, which explores the value of creativity and the idea of art as a gift rather than a commodity. Extending the flower to a stranger becomes a simple act of generosity. As the curators explain, there is an "ongoing potential of flowers to express the best of human character and action." Flowers are more than objects of beauty; they also embody our dreams and inspire hope. I'd love to also tell you about the interesting film I saw, the one I mention at the beginning of this post, but I've run out of time and room. So I suggest clicking on the links and finding out whether that film and similar ones are available where you live. I learned a lot about a period in American art that I had known nothing of before I sat in the theatre and listened to curators and art historians speak about an exhibition that traveled during 2015-2016. The painting at the very top is by Maria Oakey Dewing (1845-1927), one of the artists featured in the film on American Impressionism. What is it about flowers that make us smile and appreciate them? What do flowers say to you? Are they symbolic of something in your culture? If you incorporate flowers in your art (painting, sculpture, fiber, jewelry, ceramics, etc. ), which ones do you prefer and why? Do you represent them realistically or abstract them? What are your favorite works of art with flowers?